Which sport has the best postseason coverage? Now is the time to find out. With the NHL and NBA reaching their championship rounds, we thought about doing something new here at Awful Announcing – a ranking of each sport’s postseason media coverage. These rankings will take into account a number of categories from the broadcast booth to the studio and everything in between to see where each sport stands with the quality of their postseason, playoff, or tournament coverage. We’ve ranked the four major sports (NFL, MLB, NBA, NHL) as well as men’s college basketball (NCAA Tournament) and college football (New Year’s Six plus College Football Playoff because honestly, do you really want us to count the Boca Raton Bowl in this?). Each sport is ranked 1-10 in five different categories and those scores are then ranked below. While some sports are exclusive to one network, others are shared across multiple networks, so the grades are weighted accordingly. Check out our rankings below and please let us know how much you disagree with them in the comments below. Or you can tell us how right we are, that’s allowed on the internet as well. Analysis: This is where the networks pull out all of the stops for the NFL. From the gold standard of announcers in Al Michaels to some of the best sports television productions in the Sunday Night Football crew in NBC, the NFL on Fox and NFL on CBS, the sport is well-covered. The networks put their best foot forward as far as play-by-play is concerned with the aforementioned Michaels, Joe Buck who has matured into one of the premier play callers and Jim Nantz. Even going back to Mike Tirico when he was with ESPN, the networks have brought out their best. Since Tirico left ESPN, the Worldwide Leader is in transition first going with Sean McDonough and now Joe Tessitore. We’ll see if the Rules of JoeTess can come over to the NFL. But the analysis, whether it’s in the studio or on-site, is where the grade suffers. This goes back to when Phil Simms was the main analyst for CBS, however, Tony Romo has been a major upgrade. We’ll need to see how he does in Super Bowl LIII to see if we can truly name him as an elite analyst. Jon Gruden was only ok with ESPN, but Troy Aikman on Fox and NBC’s Cris Collinsworth prevent the game analyst grade from dropping further. The studio, mostly with the upheaval at CBS and ESPN, drops the grade to 6.5. Fox’s studio has been around for a long time and could stand to use a refresh. NBC’s pair of analysts of Tony Dungy and Rodney Harrison really don’t stand out from the pack. Analysis: When evaluating ESPN and ABC’s coverage of the New Year’s Six, it’s hard not to think of the murderer’s row of talent the network has lost the past few years. Gone are Brad Nessler, Brent Musburger, and now Joe Tessitore. Chris Fowler is no longer doing double duty for Gameday and Chris Spielman moved over to Fox. While the overall viewing experience is still really damn good for the most part, you’re just not going to maintain the level of product you had. The good news is that Fowler has improved and hopefully will continue to do so, and in my estimation, Kirk Herbstreit is the best analyst in all of football. Rece Davis, Kevin Negandhi, and Adnan Virk give ABC and ESPN a ton of flexibility in terms of studio host options to optimize coverage to meet the quirkiness of the playoff schedule. ESPN has a pretty healthy stable of studio analysts but individual likability seems to be pretty inconsistent across fans and often tied to team and conference loyalty. Looking at the other booths, Sean McDonough returns and while a steady voice, I think most college football fans will miss Tessitore calling the other playoff game. There are some surprises and hidden gems in the rest of the bunch but I’d imagine most fans don’t particularly clamor for Steve Levy, Bob Wischusen, Dave Pasch, and Dave Flemming. Brian Griese and Todd Blackledge are familiar voices, but have hit their ceiling on a few fronts. I’m more partial to Greg McElroy in studio and have found Brock Huard to be a bit grating at times. Analysis: The NBA postseason may have the best collection of play-by-play talent when you consider the likes of Kevin Harlan and Ian Eagle call the early rounds on Turner networks and Marv Albert hasn’t called the NBA Finals for years. At the top though, Mike Breen remains one of the most criminally underrated announcers in all of sports. The game analyst ranks could use a Tony Romo-like fresh face, especially on the Bristol side of the equation. It’s been great to see Doris Burke get more reps at the broadcast table as a game analyst and she leads the pack amongst NBA sideline reporters. 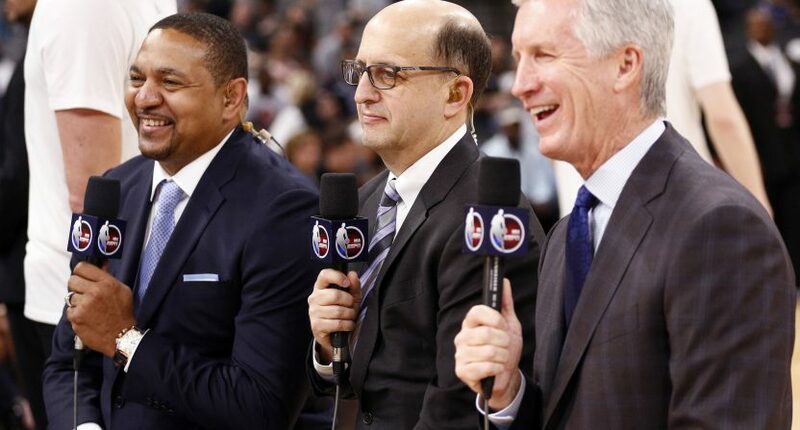 Hubie Brown remains as excellent as ever, but it might be time to shake up Jeff Van Gundy and Mark Jackson and bring in someone new with fresher eyes for the game. In the studio, much of the grade here is carried by the best crew in sports at Inside the NBA led by Ernie Johnson and Charles Barkley. But don’t totally discount ESPN in that equation, who is miles ahead of where they were a few years ago. The quartet of Michelle Beadle, Jalen Rose, Chauncey Billups, and Paul Pierce is a drastic improvement on experimenting with the likes of Michael Wilbon, Bill Simmons, and Magic Johnson. Who could forget this lovely bit of awkwardness? Analysis: In most of these categories, Fox lifts the ranking upward, while TBS pulls it back down — which is exactly what you would expect when one network carries baseball year-round while the other airs only occasional games leading up to October. Given that ESPN and MLB Network broadcast only three playoff games between the two of them, they didn’t factor heavily into the rankings here at all. Let’s start in the play-by-play category. Fox’s Joe Buck will always have his haters, but he generally makes for a solid, capable announcer whose voice has become the backdrop of October. With Matt Vasgersian now at ESPN, the unobjectionable Kenny Albert and Joe Davis figure to call Fox’s Division Series matchups. Over on TBS, Ernie Johnson can sometimes seem miscast on baseball duties, but Brian Anderson does a good job. Overall, this isn’t a remarkable group, but there’s no real weak link. The same can’t necessarily be said about Fox and TBS’s game analysts. John Smoltz might be the most highly regarded national color commentator working, but that’s not saying all that much. Ron Darling takes a lot of criticism each postseason, the new ESPN booth with Alex Rodriguez and Jessica Mendoza hasn’t quite meshed, and the less said about Joe Simpson the better. Dennis Eckersley on TBS and A.J. Pierzynski on Fox did a nice job during the Division Series last fall, though. If we were doing this exercise a year ago, the studio categories might have gotten 10s. There simply might never be a better baseball studio show than the one Fox pulled together in 2016, with Alex Rodriguez, Pete Rose, and Frank Thomas alongside host Kevin Burkhardt. It was magical. The 2017 version, however, simply didn’t have the same chemistry — and neither did TBS’s show, even with Casey Stern emerging as a compelling host. And then there’s production value, which tends to be very high on Fox and… less than that on TBS. Remember “Carl Ripken Jr?” And “the first Indians outfielder to start a postseason game since 1948?” And years of bad scorebugs? TBS really need to get this stuff straightened out. We can only hope Fox learned its lesson in 2017 and cuts back during the coming postseason. Analysis: The NHL postseason has some terrific play-by-play voices, particularly Mike “Doc” Emrick, Chris Cuthbert and Gord Miller. (TSN losing the Canadian national NHL rights has worked out very well for NBC, as they’ve been able to use TSN veteran announcers Cuthbert and Miller at times during the season and then extensively in the postseason.) Kenny Albert is solid, too, while Brendan Burke is an up-and-coming voice, and John Forslund and Rick Peckham have done good work. The game analyst side also has some highlights; Brian Boucher continues to be excellent and AJ Mleczko has been a nice addition, Darren Pang and Joe Micheletti are very good, while TSN’s Ray Ferraro does strong work. And it will be great to have Eddie Olczyk back in the main booth for the Stanley Cup Final. (He’s been doing mostly studio work this postseason following time off for cancer treatment.) But the grade here really drops thanks to the two highest-profile analysts, Pierre McGuire and Mike Milbury. Bring up either McGuire or Milbury around most hockey fans and you’ll probably get a negative response, and for good reason. McGuire’s constant referencing of where players played junior or college hockey (and sometimes even lower levels!) has become a meme, as have his at-times uncomfortable interviews with and comments about players and his attempts at humor (the “Pierre chuckle” is a thing, but it’s rarely anyone else laughing). Meanwhile, Milbury tries to bring the contrarian back-in-my-day approach that’s worked well for Charles Barkley in the NBA, but does so with none of the humor, makes horrible comments about some players, and takes himself entirely too seriously for a failed GM who’s most famous for assaulting a spectator with a shoe (or attacking a 12-year-old player). There’s a reason over 10,000 people signed a petition to remove him. On the studio side, Kathryn Tappen and Liam McHugh are great hosts, keeping discussions moving and asking smart questions of their analysts. And there are some really good studio analysts, particularly Keith Jones, Olczyk, and Boucher (when they’re not in the booth), and some other solid ones like Anson Carter. But this grade takes a dive thanks to Jeremy Roenick, who’s full of more hot takes than insight, and Milbury (when not in the booth), who’s similar. The studio analysis on NBC coverage can either be really enlightening (especially the Jones/Olczyk pairing) or worth instantly muting (when it’s Roenick and/or Milbury). Roenick also drags down the intangibles score, as NBC’s decided it’s fun to show him running around arenas and doing stunts (such as joining the Vegas drum line, dressing as Elvis, or dressing as a Jets superfan), infecting the rest of the broadcast with a JR virus that broke its intermission containment. Analysis: It’s hard to have any complaints about the NCAA Tournament’s play-by-play, and the coverage hugely benefited from the outstanding Ian Eagle finally getting to the call the Sweet 16 and Elite Eight. He was made for this tournament. But you also have Jim Nantz, Kevin Harlan, Brad Nessler, Spero Dedes, and Brian Anderson as part of the play-by-play group. Maybe you miss Gus Johnson (now with Fox), but this is a tremendous lineup. As for the color commentators, you get the amazing enthusiasm from Bill Raftery, and reasonable analysis overall, particularly from Grant Hill and Chris Webber. I gave the studio host “only” an 8.5 just because college basketball analysis isn’t Ernie Johnson’s strength, but then again you’re not really asking him to analyze it when multiple analysts sit next to him. He’s the best studio host in the business. But there are better people out there to analyze college basketball than Charles Barkley and Kenny Smith. It brings some of the fun Inside the NBA flavor to the NCAA Tournament, but it feels a bit awkward and out of place at times. The production value of the NCAA Tournament games is pretty straight-forward, but we’re talking four channels using the same format and tons of games going on, so that’s to be expected. The broadcast is a simple, clean look, and for most of us, that’s a good thing. There has been a lot of uproar over CBS/Turner’s use of showing kids crying in the stands after their team exits the tournament. Okay, so the intangibles. This really drags the score down, and it’s solely because of how incredibly awful one thing was: The Selection Show. This is the easiest thing to do too! Literally all you have to do is reveal a bracket. This has — somehow — annually been a train wreck, and this year it was — somehow — the worst it’s been.